I’d recently acquired Rose Beranbaum’s newest cake book (Heavenly Cakes), and wanted to make something from that . I settled on Woody’s Lemon Luxury Layer Cake (page 43), because the lemon flavor seemed bright and cheery, and I hadn’t really done anything interesting with white chocolate in a while. Plus, I wanted to try out my new transfer sheets. The cake is a lemon butter cake, baked in two 9″ layers that are split and filled with homemade lemon curd (Rose’s fabulous recipe, that works like a charm and tastes amazingly zingy). The white chocolate lemon buttercream was the real surprise in this recipe. The technique Rose calls for is one that I’d never come across before – essentially, you make a white chocolate custard, cool it, beat in butter and then beat until stiff peaks form – and then leave it at room temperature for up to 2 hours until “slightly thickened and spongy”. Then you beat until smooth, and beat in the lemon curd. Why the fermentation period? The buttercream was smooth and creamy and tasty – everything you want – but I can’t quite figure this one out. It’s easier, overall, than doing either French or Italian buttercream, but you have to have those two hours of downtime. Does anyone know what’s going on, here? In any case, the cake and buttercream both came out delicious, I put it all together and decorated with white chocolate shards, and served with either raspberry or blackberry cabernet sorbet. The not-birthday-boy and his friends/family were highly pleased; very little of this cake was left after the party! Another hit, Rose. 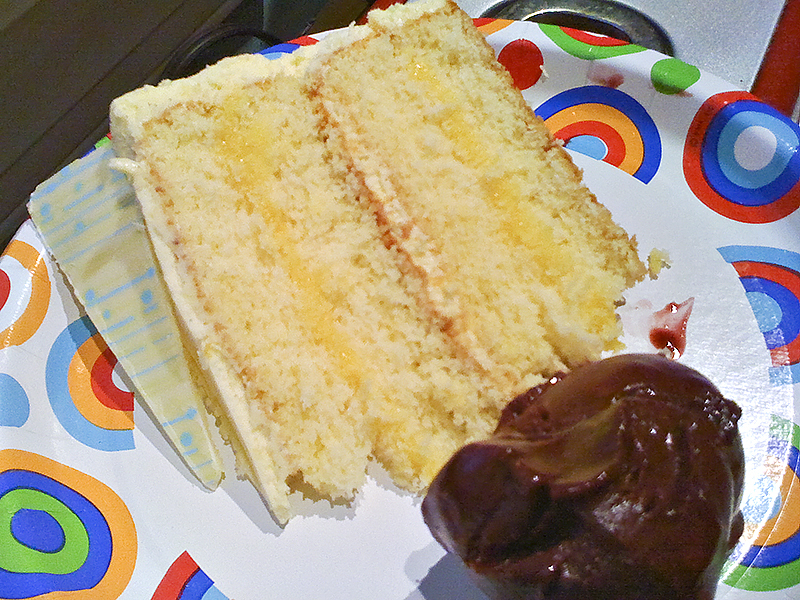 Cake Slice: Triple Lemon Chiffon Cake! What lemony, lemony goodness. It’s almost like it’s… Spring! The lemon curd was fairly simple to make, although somewhat stressful on my arms (all that whisking). But TAAASTY. Oh goodness. I loved that I had enough left over from filling the cake to decorate the top – like daisies! Anyways, this was another winner, although I’d be more careful with the buttercream next time (or just make more). 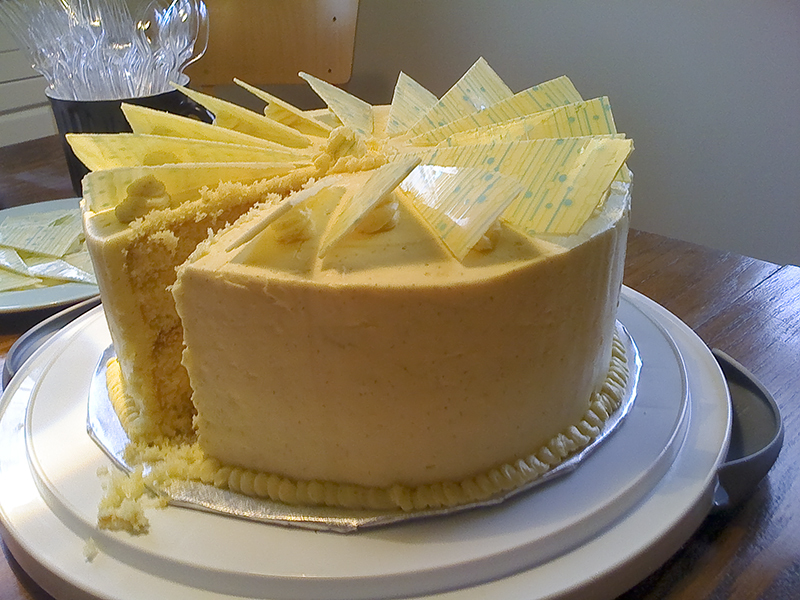 To see what everyone else did with theirs, check out the Cake Slice Bakers Blogroll! 1. Preheat the oven to 350*degrees F. Line the bottoms of three 9-inch pans with parchment paper but do not butter or grease the pans. 2. In a med-large bowl whisk together the egg yolks, oil, lemon juice, lemon zest, and water. 3. In the bowl of an electric mixer, whip the egg whites with the cream of tartar on medium speed until light and frothy. Slowly add 1/2 cup of sugar and continue to beat until soft peaks form. 4. Sift the flour, remaining sugar, baking soda , and salt into a large bowl. Whisk gently to combine. Make a well in the center of the dry ingredients. Pour in the egg yolk mixture and mix to create a smooth paste. Add one-fourth of the egg whites and fold in to lighten the batter. Fold in the remaining egg whites and divide the batter among the three pans. 5. bake for about 16 minutes or until a cake tester comes out clean. Transfer to wire racks to cool in the pans. Once cool run a knife around the cake to in order to un-mold the cakes. Carefully pull off the parchment paper from the bottoms of the cakes. 6. To assemble the cake, place one layer on a cake stand. Top with a heaping 1/4 cup of lemon curd and spread it evenly. Repeat with the remaining layers. Frost the top of the cake and the sides with the lemon cream frosting. * 4 tablespoons of unsalted butter, at room temp. 1. Whisk together the whole eggs, yolks, sugar, lemon juice , and lemon zest together in a medium bowl. Transfer to a small non-reactive saucepan. Gently heat the mixture, whisking until it thickens enough to coat the back of a spoon. make sure not to boil the mixture. Pour the mixture through a sieve into a heatproof bowl. Stir in the butter and cover the curd with plastic making sure the plastic touches the curd. This should prevent a skin from forming on the curd. Refrigerate until cold. Then remove 3 tablespoons of curd and set it aside for the icing. 1. Whip the cream and sugar in a large chilled bowl until stiff peaks form. Fold in the lemon curd, forming a stiff frosting.